Wyoming Caucus Results: Bernie Sanders Projected To Win : The Two-Way The Associated Press projects that the state will be the latest in a string of wins for the Vermont senator in the West. But the path ahead against rival Hillary Clinton is expected to get rockier. Support for Sen. Bernie Sanders in Wyoming was shown in more than just the votes that declared him winner of the Democratic caucuses there on Saturday. Democratic voters in Wyoming have decided: Sen. Bernie Sanders has won the state's caucuses, according to The Associated Press. But the victory over Hillary Clinton will not ensure Sanders more delegates. The state's 14 delegates will be split evenly between the two candidates. 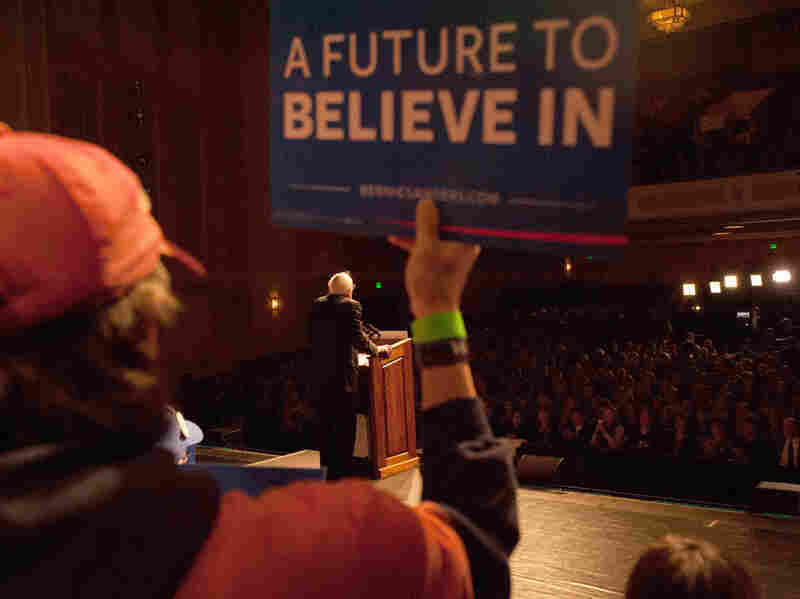 "We congratulate Senator Sanders on a spirited campaign in Wyoming. Outperforming expectations, Hillary Clinton tied in pledged delegates today and now leads Senator Sanders by approximately 220 pledged delegates nationwide. Thanks to the help of thousands of volunteers, Hillary is winning the popular vote by almost 2.4 million and has a nearly insurmountable lead in pledged delegates that will become harder and harder to overcome after each contest. We are grateful to our supporters who know that Hillary Clinton would be the best candidate to break down the barriers that hold Americans back." Sen. Bernie Sanders speaks during a political rally on April 5 in Laramie, Wyo. Sanders spoke to a large crowd on the University of Wyoming campus after winning the Wisconsin primary. Wyoming, a deeply red state, isn't exactly up for grabs in the general election; most onlookers expect the state to vote Republican, no matter who the GOP ends up choosing as its nominee. But that didn't stop both Clinton and Sanders from setting up campaign offices and running television ads there. And, even as headlines have showered attention on the delegate-rich primary in New York on April 19, Sanders himself visited Wyoming earlier this week, holding a rally at the University of Wyoming. Former President Bill Clinton campaigned on behalf of his wife in Cheyenne. "I think when people get to see and hear a candidate or a former president first hand it really inspires them to understand the true meaning of an election," says Aimee Van Cleave, the executive director of the Wyoming Democratic Party. It's the latest in a string of victories for Sanders in Western states that hold caucuses. He also won in Idaho, Utah, Colorado and Washington state. In each of these contests, demographics and a strong grass-roots organization have helped Sanders nab delegates, though he still remains well behind Clinton in the overall pledged delegate race. Sanders has now won eight of the last nine contests in the Democratic race. That said, the path gets much tougher after this for Sanders, with a calendar dominated by primaries in states with larger, more diverse Democratic electorates. Many of the upcoming primaries are closed to Democrats only, so the independent voters that Sanders has been doing very well with won't be able to vote. A few caucus locations across the state had to be changed ahead of time to accommodate larger numbers of voters. In Albany County, one of the larger counties in the state, more than 1,200 people showed up to caucus in an ice rink. Most voters were wearing buttons or stickers in support of either Clinton or Sanders, but the mood was unmistakably friendly between the two camps. Wyoming State Representative Cathy Connolly was there supporting Clinton. "I will caucus for Hillary. If Bernie ultimately wins, I'll be the biggest Bernie supporter you ever see," says Connolly. 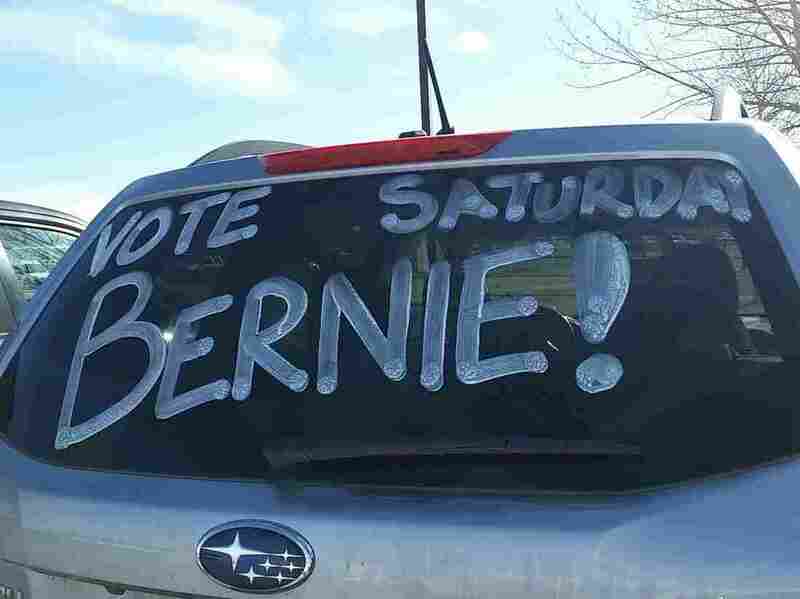 Amanda Holliday was handing out Bernie Sanders stickers in Albany County. She's a law student at the University of Wyoming, but is originally from Georgia. She says this was her first caucus. "I'm super excited. I'm from a primary state, so all we do is just cast the ballot privately and walk out, so this is exhilarating. I'm just having the time of my life," says Holliday.